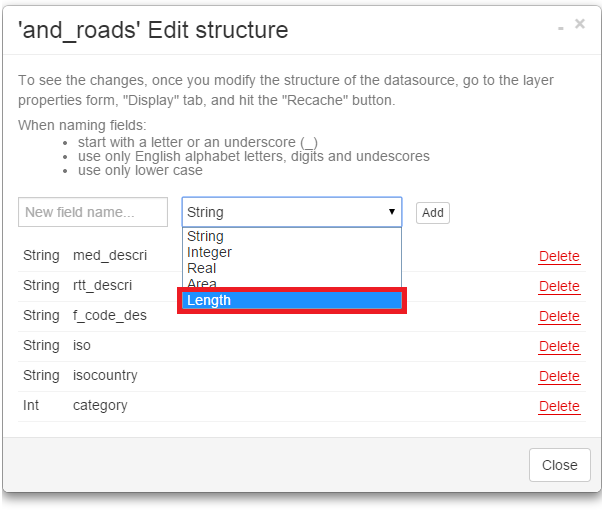 The new column can be added or removed from the layer attribute table. Double click the layer you want to edit or go to Layer tab and click Edit Layer. In the Attribute tab choose Edit attributes option. Set column name and data type. Start with a letter or an underscore (_). Use only English alphabet letters, digits and undescores. Click Add button, Close and Save. Note: if you want to attach photos to the newly created column, set String column type. Go under Layer Properties and under Display tab click Clear layer tiles button. Click Refresh Data Grid button. Length and Area fields are automatically populated fields that display length of the line feature or area of the polygon feature. Values in those can’t be edited as they are automatically generated. Values displayed in the data grid use units of the map. If the projection uses meters, the values displayed in data grid will also be in meters. If the projection of the map uses degrees, the numbers in the columns will also show degrees units. Map Projection can be checked in Map Properties, Under Advanced tab. Area and length units can’t be changed unless the layer is reprojected to the projection with desired units. 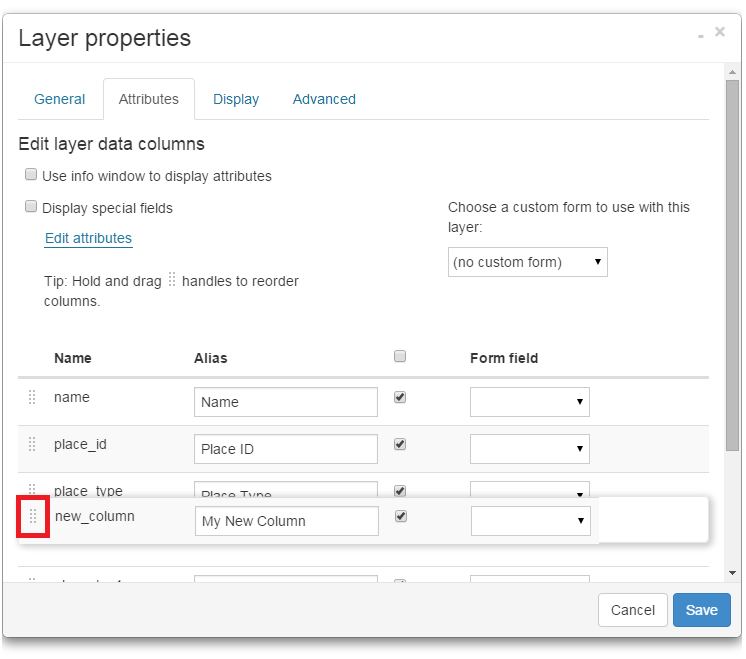 Please note that Area/Length columns have to be removed from layer (Layer Properties – Attributes tab – Edit layer) and added again in order to display the new units. Note: layer has to be imported into Database. Only layers added to a map from Database can be edited and display area and length. Select a database line layer. 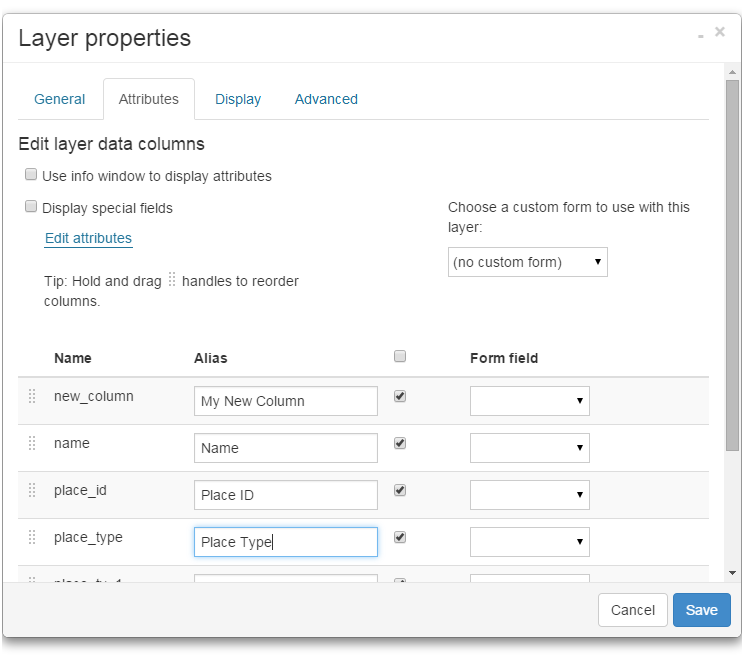 Go under the Layer Properties – Attributes tab. From the drop down menu select Length field. 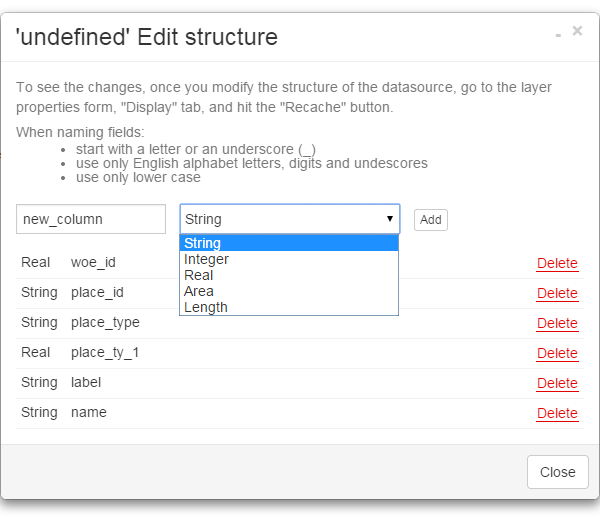 Go under Layer Properties and under Display tab click Recache button. To add Area column select a database polygon layer and repeat steps above. Select Area from the drop down menu. 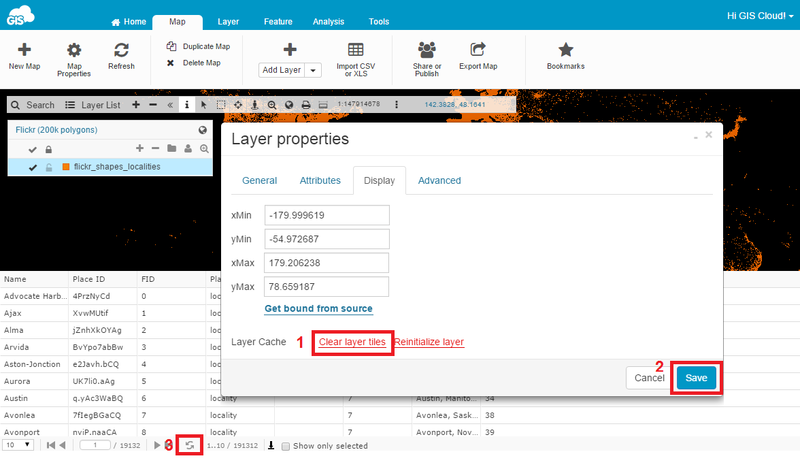 In the Attribute tab you can also assign alias to layers columns. If you have created column under one name and you wish that other appear in the data grid, type in the alias and that will be visible name for selected column. Click Save and refresh Data Grid. To reorder columns order hold and drag the dots next to the layer name. Click Save and refresh Data Grid to see changes. 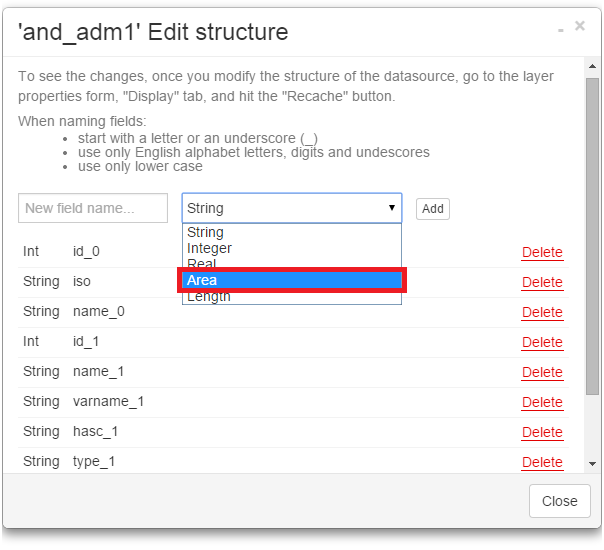 You can also access database layer structure through the Database Manager. 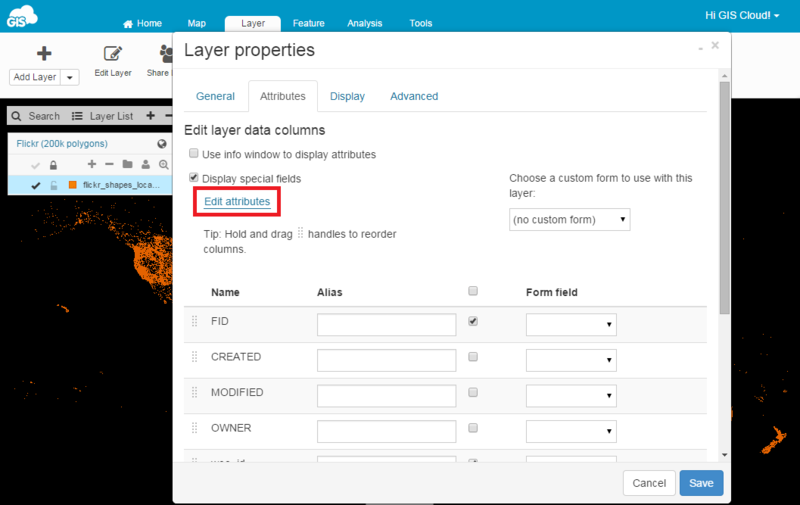 Under the Tools tab, choose the Database Manager and it will open the list of all layers imported into the database on your GIS Cloud account. To make changes on the specific layer select layer and under the Actions drop-down select Edit fields. Edit option will guide you to the same panel for structural changes like to one we have entered over the Layer properties.